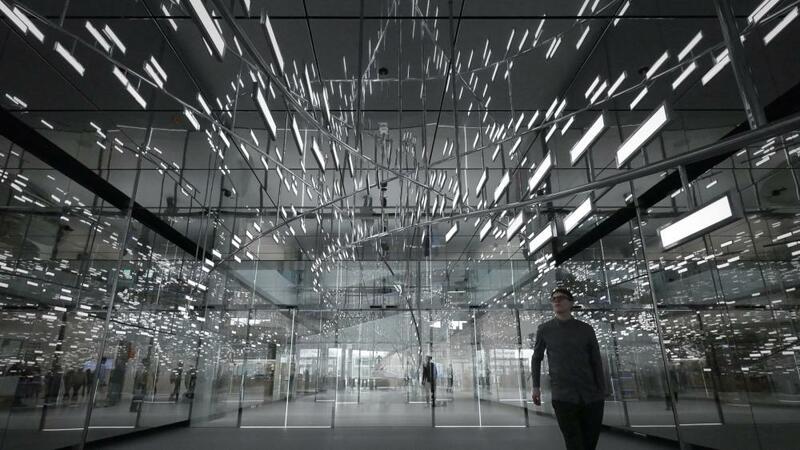 The light and sound sculpture is composed of 576 organic light-emitting diode (OLED) panels, and sensors which create an intelligent system interacting constantly with people moving through the space. Data, emotions and memories coalesce in the sculpture, into an audio-visual artwork. Eighty-five linear, generative and interactive scenes create a synaesthetic cosmos in which ideas of connectedness, innovation and collaboration can be experienced. The multimedia choreography evokes the impression of a living organism. Cognitive and emotional states like Sleeping, Dreaming, Remembering, Feeling, Observing, Thinking and Playing create the conceptual themes for the piece. Natural, synthesized and abstract soundscapes produce diverse and constantly changing compositions. During the playful modes, Light Cloud interacts directly with visitors, the sculpture captures the movement of people within the space and translates it into a light and sound atmospheres.